The fabled Rio Grande River is drenched in symbolism and historical significance, serving as a long border between the U.S. and Mexico. 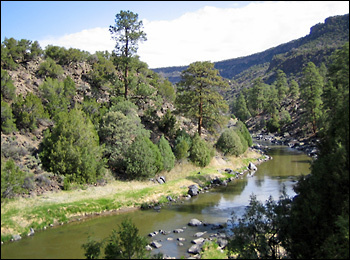 Far north from the border however, in northern New Mexico, the river tells its own story of eons of geologic change and human habitation. The narrative is told through layers of rock forming a deep gorge, providing the riverside hiker with an unfolding, impressive panorama. The human story is less obvious but no less dramatic. 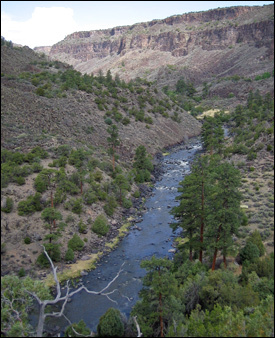 Access from the top of the gorge to the river’s edge may be found (among other places) from Cebolla Mesa, west of Lama in Carson National Forest off New Mexico 552. The top of the wind-swept mesa was scented with sage and sprinkled with pinyon pines this mid-May 2006 morning, with partly cloudy skies and moderate spring temperatures in the 60s. A small campground at Cebolla Mesa provided a few prime camp sites overlooking the gorge, with the faint sound of the river below reaching the heights. The primitive campground was a little trashy on my visit, but the accommodations provided a good place to pitch a tent and prep for a hike the next day. Trail 102 near the center of the campground descended to the river, following a path north along the eastern side, providing a great out-and-back hike of about 8 miles roundtrip. A marker at the beginning of the trail indicated the distance to the river from the top of the mesa — 1.25 miles. The sound of the river below, increasing in volume as one descends, provided an pleasant audio accompaniment to the hike. The trail was lined w/ small boulders and the familiar pinyon, sage, rabbitbrush and juniper that cover the rolling hills of northern New Mexico. The air was also filled with the hooting of owls or mourning doves all along the length of this trail. 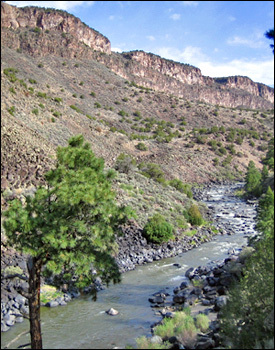 At the riverbank, the Rio Grande was running wide and deep, channeling snowmelt from the high mountains upstream into fast-running whitewater rushing over large boulders strewn about the riverbed. The point where the trail met the Rio Grande marked the river’s the confluence with the Red River. A footbridge crossed the Red River. The small La Junta campground, with a shelter, is found here, presumably a prime spot to cast a line out into the current. The trail continued north, traversing for a time along the terrain between Rio Grande and Red Rivers. The Red River carved its own deep canyon to the northeast, visible as the hiker visually traced the river’s route to the north. A trail marker soon indicated that another 2.4 miles took one to Big Arsenic. The trail rose and fell gently in its path along the river to Little Arsenic campground, outfitted with several stream-side shelters. Just past the campground, a small, verdant springs appeared, tumbling down from the upper reaches of the gorge. Beyond, the river scrambles over rushing rapids, as the volume of the river increased. The trail then switchbacked up quickly about 100 feet above the river, passing over a large skree field and rising to a small mesa. A side trail led up to the top of the gorge — Big Arsenic Rim. The trail then descended down to Big Arsenic campground. Douglas fir and large, ancient, weathered junipers sculpted by the wind dotted the trail along this stretch, along with rabbitbrush and squaw brush. Down at the campground, Big Arsenic was very lush, fed by a stream cascading down from the hillside. Large boulders were strewn about. 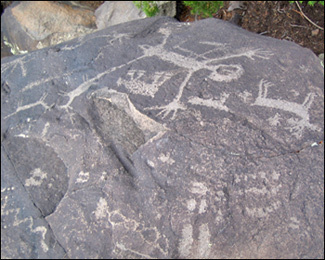 Along the trail, hidden among rocks close to the river, were a few choice examples of rock art images. These fascinating mini-tableaus hinted at a long history of human habitation here along the Rio Grande. One example was found on a rock bordered by a larger pile of large boulders. Approaching the rocks and climbing up to position for a snapshot, I was startled by a low, deep growl emanating from an unseen crevice in the rocks. I quickly took the picture, jumped down and moved away, ready for something to strike. I have no idea what growled at me among those rocks: wild dog, bobcat, bear, mountain lion. I didn’t wait around to find out. The dragon guarding the treasure, it seemed. Dragonflies darted around me, offering no clues. I wondered, however, with all the large rocks both streamside and in the river itself, what other tableaus may be in the gorge, stories of ancient hunts, battles, comets, visitations. Some of the more prominent images were partially covered by lichen, as if nature was slowly closing the book on that particular story. Some appeared on rocks that had surely shifted or rolled downhill since the time they were drawn. Later, returning along the trail to Cebolla Mesa, a light rain started to fall and the wind kicked up. The air soon filled with the strong aromas of pinyon and sage, adding another element to this magical scene along the river. This isn’t the deepest part of the gorge, but easy access and the relative solitude found here make the Cebolla Mesa trail a rewarding experience.